Yesterday, I noticed that one of the non-salvageable questions I had contributed towards closure was edited to no longer include its original content (it was something along the lines of "I just searched over the internet and found the answers that I was looking for"). I reverted the edit and posted a comment to warn that this isn't good conduct for the site. The reply ended up not being so good. Of course, one could draw some various remarks from this exchange. The comment was terser than the OP had wished. I also know that I did not have to comment, and that I'm bound to find toxicity sooner or later from this. I never really checked my brain's volume either. Please do not vandalize your posts. By posting on the Stack Exchange network, you've granted a non-revocable right for SE to distribute that content (under the CC BY-SA 3.0 license). By SE policy, any vandalism will be reverted. Given the circumstances, and just to be sure: is it appropriate to use the word "vandalize" or its variants for inappropriate modifications to questions and answers? What other ways can we portray the same meaning, or warn the user not to do this? There is no need to remove the question text in situations like this one. Just leave the question as it is (or delete it yourself -- it is fine to do that as long as your question has no answers). Please do not vandalise questions -- even if you happen to have posted them. deliberately destroy or damage (public or private property). Since that’s precisely what happened, yes, the word is fine to use. No, it is not “insulting”, “bullying”, or anything similar. It’s not your fault the OP doesn’t know what the word means (or that they do know what it means, but nonetheless insist that they’ve been “insulted”). The only inappropriate behaviour here was the OP’s insults at you - just flag those as rude/abusive and move on. The definition of vandalism doesn't really matter. Nor the overreacted answer from the OP. While the usage of this word is perfectly valid here; bear in mind that it possesses a pejorative connotation. In the end, the OP just innocently wanted others to know he found a solution. He didn't want to deliberately destroy his question. The OP may not even understand how it falls into the vandalism category. Instead, you could have explained to him why it is important to keep the question intact. "Vandalize" is standard terminology for what happened there. The OP completely overreacted and started insulting you. I see no reason to change your wording based on these events. We shouldn't be "Less confrontational" every single time some ignorant user blows a comment way out of proportion. We can't please everyone, and you can't prevent anyone from feeling insulted over trivial matters. Stop adapting to extremes like that. You see, in our century, we've learned not to fear words. Don't worry about your word choice that much. Just make sure it's accurate and professional. 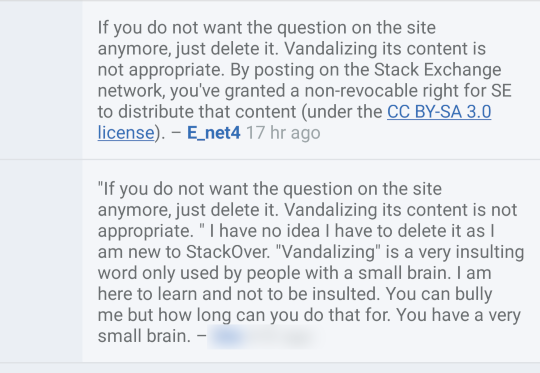 I agree that vandalizing was the correct term and that there is no excuse for answering you with such a comment. Please don't edit "Problem solved" into your question. If you are not interested in an answer any more consider deleting the question. would have achieved the same goal without threatening them with licensing terms. Your current comment reads (at least to me) as "You've done something terrible bad and if you violate our license again we will sue you.". No wonder the OP didn't take it that well. Pointing someone to the license is (IMHO) only appropriate when you feel that someone removed content to prevent it from being found (e.g. homework help that shouldn't be found) or when someone really insists on removing content. Not when someone misunderstood how the site works. The modern English words "vandal", and "vandalism" are directly derived from the name of the Vandal tribes. Presumably the tribes were doing what a lot of other groups were doing at the time, but the losers in history are always recorded as the villains. I would be surprised if anyone alive today would identify as an ethnic Vandal. And any that did are holding onto some sketchy genealogy as an opportunity to be different. If the concept of Political Correctness had existed in the 6th Century then, yes, I could agree that some people could have found the pejorative use of the word offensive at the time. It's the 21st Century now - I don't think we have to be worried. Vandalism is a technical term used by people with "medium sized brains". The assertion "you have a small brain" is juvenile and absolutely irrelevant. It is probable that the author of the juvenile response did not know that vandalism was a "technical term" used by people with "medium sized brains" and was mistakenly "responding in kind". On Wikipedia, vandalism has a very specific meaning: editing (or other behavior) deliberately intended to obstruct or defeat the project's purpose, which is to create a free encyclopedia, in a variety of languages, presenting the sum of all human knowledge. The malicious removal of encyclopedic content, or the changing of such content beyond all recognition, without any regard to our core content policies of neutral point of view (which does not mean no point of view), verifiability and no original research, is a deliberate attempt to damage Wikipedia. There, of course, exist more juvenile forms of vandalism, such as adding irrelevant obscenities or crude humor to a page, illegitimately blanking pages, and inserting obvious nonsense into a page. Abusive creation or usage of user accounts and IP addresses may also constitute vandalism. Vandalism is prohibited. While editors are encouraged to warn and educate vandals, warnings are by no means a prerequisite for blocking a vandal (although administrators usually only block when multiple warnings have been issued). When OPs decide that an overblown reaction to a post has occurred, including agrumentum ad hominem, the OPs may want that post deleted as noncontributory to the site. The arguments presented in this stream suggest that although OPs have authored posts, they are vandals with respect to their own words even if they are victims of mob action because they further have no ownership of their words; the site owns them. Somehow something is lacking in the argument. A reputation is yours to lose, but the site owns its impolite action with respect to you. This seems to be an antidemocratic approach to contribution and a turnoff. Now, I don't think the OP of that question wanted to "destroy or deface" it, let alone that their intent was "malicious". build a library of detailed answers to every question about programming. They came to Stack Overflow to get an answer to their question. When that didn't happen, they solved the problem themselves and edited the question to say so. That does not strike me as vandalism. When someone is accused of vandalism, or other malicious behaviour, they generally do not take it so well. Especially since in this case, they thought the accusation unfounded. So in cases like this, assume good intentions on the part of the OP instead, and explain why the edit was not in the spirit of the site. Or just link them to the tour page. Keep in mind, you do not have to engage with people in that way at all. Rolling back the edit is perfectly fine on its own (leaving a short, neutral revision comment to the effect that you restored the question is probably warranted though). First of all: his comment was completely unnecessary and ungrounded. Even though the response on your comment wasn't appropriate, attacking it is not logical and seems like the typical strawman argument.. Rather try to solve the problem and avoid people misinterpreting the word "vandalizing" in the future I'd say. Communication is always 2 way traffic. Should we say “vandalizing” to refer to defaced content?" I would rather use the word "disfiguring". Depending on the intention of the person disfiguring a post, it can be considered vandalism though. This might as well have been vandalism, but assuming this is ungrounded. Saying that it's completely certain that he vandalized is the typical ad hominem argument and is a logical fallacy. I don't think 'Vandalism' was an appropriate word here. You had a part in closing the question as unsalvagable, right? How does the question any longer have a value? You and others had already decided to throw it onto the SO trash heap. While the edit certainly didn't improve the value of what was posted and caused more work for the edit review queue, I wouldn't say that it decreased the value either, or it shouldn't have been closed as non-salvageable. It's the difference between spray painting a smiley face on your neighbor's car hood, or on a rusted old hood laying in a ditch somewhere. Questions should only be edited to make them more clear or provide more information. You should be able to delete your own question. The code of conduct says we should be nice, is calling them a vandal nice? I would like to focus on the word "vandalizing". Not sure if you can vandalize your own work. That sounds a bit strange. After all you could delete your own question (as was proposed in the comment) and that would not be regarded as vandalism, or would it? Maybe there is another, better fitting word. What about "removing content" which is much more specific than vandalize and also doesn't possess a pejorative conotation. Should the c++1y tag refer to c++17? Should we roll back defaced deleted questions?